Tenth of a Litre, Meter Cheater. It is 25 years since I last rode a scooter. It was a Raleigh Roma, 90cc of temperamental, unreliable junk, it was unceremoniously ditched as soon as I could afford a car. The memories are all too clear, a dreadful cable operated gearchange, almost impossible to start, no brakes and all the poise and stability of Billy Connolly doing his one-legged drunk routine. My brother had a Lambretta, considered cooler, but it was even worse. In short, all I remember about scooters is that they were bad news. Bearing this in mind, I was less than overjoyed when "The Scotsman" asked me to do a review of the new style scooters. My brief was to ride one around town and discover whether they are the panacea to todays congested urban roads. I couldn't even find an excuse as the ever helpful Alvins Motorcycles had offered the use of a brand new Suzuki for the occasion. Ah well, a man's gotta do what a man's gotta do, and all that stuff. The little beast in question was a Suzuki AH100, a 99cc 2 stroke with a blistering 7.9 bhp, little more than my lawn-mower. Fully automatic, no gears, no clutch, just a throttle and two brake levers, dinky little alloy wheels painted gold, and the tiniest disc brake I have ever seen. It seemed to weigh so little that if all else failed, at least I could at least carry it back to the garage! I gritted my teeth, hoped there was no one around that recognised me, and set off into the traffic. Ten seconds later the rain started, and Edinburgh's streets turned into a lake of floating diesel and polished cobbles. What a way to spend a Saturday afternoon! So why is it that two hours later I handed it back, dripping wet and with a silly big grin on my face? The answer is simple, I just plain enjoyed myself. Forget everything you think you knew about small urban transportation and try one of these. This scooter is easier to ride than a push-bike, there is simply nothing to do, just open the throttle, it is completely unintimidating. It is hard to describe the handling, as it doesn't really have any (and that's a compliment) and the brakes are superb, even in the wet. Economy?, suffice to say that I emptied the tank, and I got change from £2 when I brimmed it. But the whole raison de etre of this thing is to park it. What a joy. There were half a dozen places scattered round Edinburgh that I needed to visit, by car this would have been a nightmare. Princes St, the Usher Hall, Tollcross, Morningside, the Grassmarket, and back to George St. No problem, just ride there, find a spot within a few metres of where you need to be and park it, helped enormously by the generosity of the traffic planners in the amount of bike-only parking in town, which deserves full marks. Only a week earlier I had spent a full 20 minutes in the car trying to find just one parking space, let alone half a dozen. There is a down-side of course. You are vulnerable, and you have to ride with care (not of itself a bad thing mind you), protective and waterproof clothing is a must, as are gloves and a helmet, and no bike has the carrying capacity of a car, even if this one has a helmet sized locker under the seat. I shudder to think what this bike must be like on a motorway, but that is to miss the point. The point is of course is that this little bike has a very narrow focus, and if you use it for the purpose for which it was intended it is nigh on unbeatable, use it for the wrong thing and you will be all at sea. 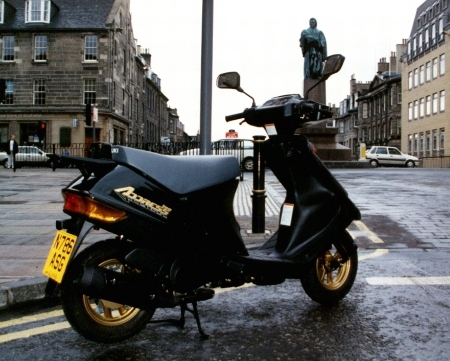 I live in the north of Fife, and for most of my journeys this scooter would be a disaster. If however I lived and worked in a densely trafficked environment such as Edinburgh, then for at least 6 months of the year, this could be an invaluable little tool for getting about my business. Better yet, at only 100cc, all of the car drivers that I was gaily scooting past could drive one of these on their existing licence, and a more gentle introduction to the delights of motorcycling would be hard to imagine. At £1899 on the road, and a few bob a week for petrol, it should make you think.